Over seventy million (70M) Indigenous People Of Biafra IPOB, across the globe are speaking with one voice for the independent of Biafra. This is why the indigenous People of Biafra (IPOB) has appraised the Radio Biafra station , letting the waorld know that it is waxing stronger despite the effort of the fantastically corrupt Nigeria government to put it off the air. It noted that the Radio Biafra propagates truth to mankind and exposes evil committed by the Nigeria government against the people of Biafra without fear or favor. The Indigenous people of Biafra in a statement, made it clear that; Nnamdi Okwu Kanu the leader of the indigenous people of Biafra (IPOB) with Mazi Alphonsus Uche Mefor Deputy director radio Biafra and Barr. Emma Mmezu, Dr. Clifford C. Iroanya, Mazi Uchenna Asegbu and others have since the inception and operation of the radio, set it for the defense of the rights of the people of Biafra and for the restoration of the ancient city of Biafra. According the statement "Radio Biafra preaches Biafra not just only as a nation or a geographical expression of a people; but as an identity and religion. It preaches the ideology that is Biafra in its totality. "The platform was created to salvage the already endangered people who have faced extermination in the hands of Nigerians orchestrated by Nigeria government and some western powers and her culture which have faced extinction. "However, radio Biafra has also to a very large extent, placed the corrupt and unethical Nigeria government and it's agents to where they belong. As long as IPOB and radio Biafra is concerned, it has become almost impossible for the Nigeria government and her agents to peddle and sustain their lies. The statement noted that during the genocidal war against the people of Biafra in 1967-1970, Nigerian government with the help of the British government, employed total media blockage against Biafrans and as a result, the world were kept in the dark about the genocidal war as their corrupt world media reported absolute lies. That is one of the reasons why the leadership of IPOB under the supreme leadership of Dr. Nnamdi Kanu took the task upon himself to ensure that Radio Biafra can be accessed from any part of the world. He added, "the radio enlightens the international community, governments of respective countries, distinguished organizations, individuals and lovers of freedom all over the world. "Considering the fact that Biafrans are scattered all over the world, Radio Biafra has done incredibly well to gather Biafrans from the ends of the earth and this has given a thrust to the agitation in general. 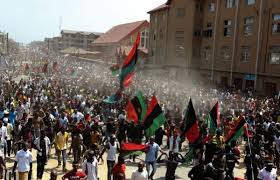 "Today, over 70 million Indigenous People of Biafra residing in over 100 countries including Nigeria and Biafra are well organized and are speaking with one voice, seeking the restoration of Biafra through self-determination as enshrined in the United Nation declaration of the right of the indigenous People. The statement continued, "Radio Biafra is an institution with multi dimensional tutorship, it has produced uncountable graduates of history and propagators of truth, it has liberated millions of Biafrans and still liberating even the black race from mental slavery.